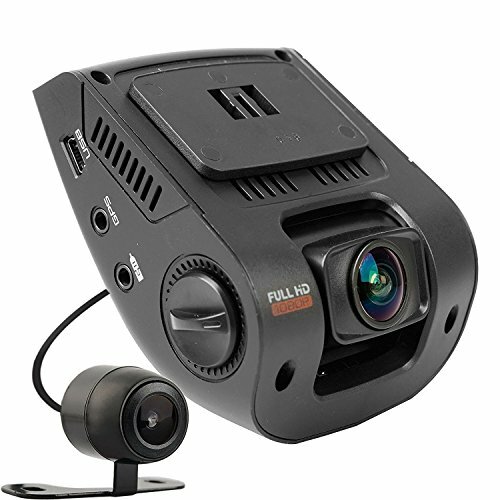 A must-have dashboard camera recorder for first-time drivers and drivers that care about safety, but not complexity. The most essential features – 1080p/30fps recording, emergency recording, night vision, wide-angle lens, 2.7″ LCD screen are all in one. 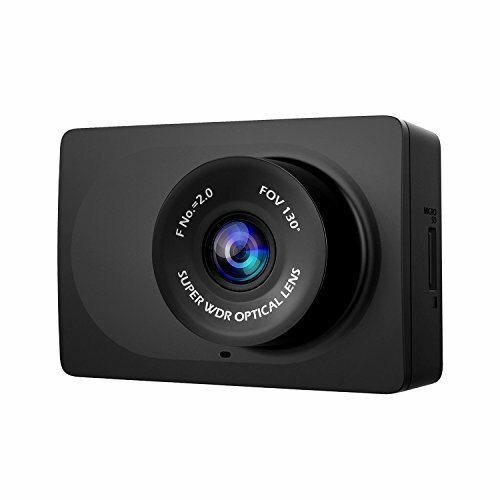 It’s simple set up, stealthy appearance and cooling system design, makes it a perfect dash camera for even the simplest of cars. The eLinkSmart Wireless IP Camera is ideal suited for home usage. You can watch your house anytime anywhere. Powerful security protection, user account would have notification if there is exception logging etc. 1) This product does not contain TF cards. Customers need to prepare themselves. 2) Record, store and review video and picture using a TF card and can be edited, deleted or shared directly from your mobile phone. When TF card memory is full, the oldest video files will be replaced. Alert pictures will be stored on the server and pushed to your smart phone. 3) Reset button is at the bottom of the product. Press 5 seconds and it can be recovered to factory default. If you have any problems like connection or firmware upgraded, please send messages, we will reply in 24 hours. ✔ EASY & FAST CONNECTION: Security camera’s wireless connection support Smart Configure or Scan QR Code, One key WiFi configuration makes your connection as simple as possible: Plug in power cable, download “eSmartCam” App from APP store or Google Play in your iPhone or Android smartphone, then set up. You can experience first using the test account on eSmartCam App, account and password are “elinksmart”, the test account only open partial functions. ✔ CLEAR & BROADER NIGHT VISION: The security camera will open the infrared night vision automatically at night, 960P HD clear night vision monitoring up to 20 feet, Pan/Tilt rotate covers every corner of your home. Real-time video recording and replaying function let you sleep at ease. ✔ MULTI-PICTURE & SHARING & ZOOM: The App can add multiple wifi cameras and support 4 cameras split-screen viewing at the same time. If your family members also download and register the App, you can share the wifi camera to his account. In order to see your home status clearly, please use two fingers slide outward or slide inward to zoom the display. ✔ MOTION DETECTION & VIDEO RECORDING: Moving things or crying voice will be detected. Our wifi camera will push alert notifications and snapshots to your smartphone. All 960P videos can be recorded, stored and reviewed to max 128G TF card and be operated directly from your smart phone. No need to worry about your home security. ✔ TWO-WAY AUDIO & NURSERY RHYMES AND STORIES PUSH: You can talk with your baby, your parents or even your pet when you are anywhere like office, Gym and kitchen, you can also select lists to control the wifi camera play nursery rhymes and fun short stories for kids. 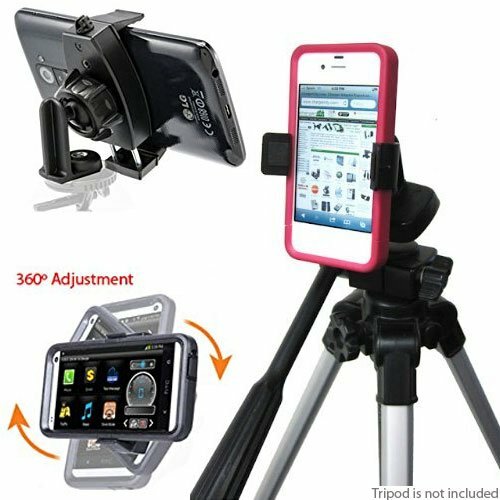 ChargerCity MegaGrab Tripod Mount is one of the Original Selfie Mount for Smartphone (Original MegaGrab1 was first introduced on Amazon in 2011), over the years we have reviewed to our customers feedbacks and we now introduce the brand new MegaGrab2 Smartphone Holder. MegaGrab2 is designed and made with Quality, Simplicity and Ease of use in mind. * SIMPLICITY holder was design and engineer with simplicity & ease to use in mind. the MegaGrab2 Holder is one of the most Versatile holder solution around. With the 360º Swivel Adjustment Ball Joint, Positioning in Landscape Portrait or anything in between is made Simple. 2) Expand the MegaGrab2 Holder to slide in your Phone, (MegaGrab Holder has a low profile fitting, provides a strong grip to your vent and accommodates all smartphones up to 3.6 inch wide (90mm). YOUR DONE, Your are ready to start your Selfie collection or Record a Professional Video. Ever want to take a Selfie picture or Record with your video with your iPhone 7 6S Plus 6 5S 5C 5 4s, Google Nexus 5 6 or Galaxy s7 s6 EDGE, LG G4 G5, Moto X G E, HTC ONE, XIAOMI Pro Video Camera phone? Want to use your own tripod to make a Professional Movie? With the New ChargerCity version 2 MegaGrab Smartphone Tripod adapter Mount, you can do all that as simply as 1-2-3. 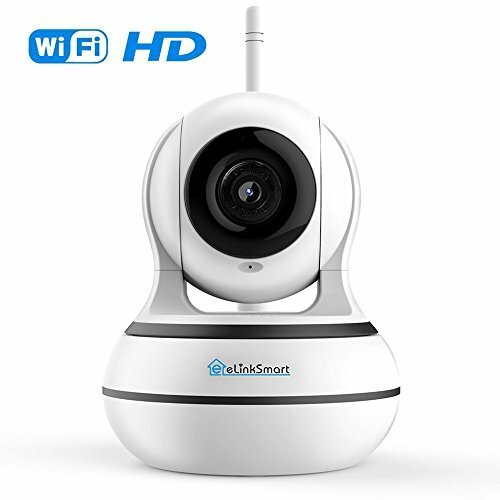 The NexGadget Wi-Fi IP Camera makes it easy to watch your kids, elderly parents, or pets wirelessly on your smartphone or tablet–anytime, anywhere. Simply download the Eye4 app to your mobile device and you’re ready to go. The camera’s adjustable wide-angle lens (355°horizontal angle and 120°vertical angle) gives you a full view of any room, superior high quality H.264 video compression format with maximum clarity allows you to experience the best live video footage. Ideal suited to small business, factory, home usage. you can watch room, baby, toddler, pet, elder person, with sharp HD video and contrast-rich voice. With the Nexgadget HD Cam, you’ll never be out of the loop again. Say bye-bye to traditional, complex setup processes that require you to have a degree in computer science. 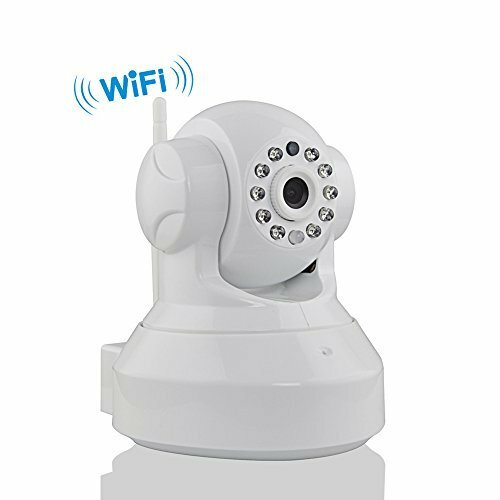 The NexGadget Wi-Fi IP Camera with the Sonic Recognition can be quickly and easily set up by anyone on Wi-Fi (and/or Wired), using a mobile device. Instantly see live video using your computer, tablet, or phone from anywhere. (1) Plug in your camera and launch Eye4 App on your phone. (2) Open the Eye4 App, choose ‘One Key Wifi Configuration’. (3) The camera will auto connects to the same wifi as your smartphone. (1) The camera will not work on a 5 Ghz wireless standard at this time. If you have a dual-band router, be sure to segregate your wireless channels and connect the camera to the 2.4ghz channel. (2) NexGadget camera can record to an internal MicroSD card (up to 64g), not included in the packaging. (3) Original password of IP Camera by Factory Setting is at the bottom of this device, eg 888888. Device User can customize the password after logging in. crystal clear HD 720p video 355º wide angle and 90º vertical angle lens, two-way audio, both day and night vision offered. feed live can be viewed by multiple users simultaneously, you can view 4 videos on the phone app and 49 videos on PC. Front Video Resolution:1080FHD 1920×1080/ 1080P 1440×1080/ 720P 1280×720/ WVGA 848×480/ VGA 640×480/ QVGA 320×240. Note: Be sure to format your SD card with your Rexing Dash Cam for optimal use. Failing to format SD card may result in card error. The LCD viewscreen size is 2.4 inches, which is large enough to view clearly while being small enough not to get in the way while you are driving. Loop Recording Option: Yes. You can turn this option on or off. When using this function, you can setup the camera so it is always recording footage and saving the video to a microSD card. You can even set up the recording time to the length of time you want. Memory: Micro SD cards up to 64GB (card not included) – use class 6 or class 10 high speed cards for best results. HDR Vision Function: Prevents videos from being overexposed or underexposed. A great feature for drivers and other frequent car travelers that will be driving in areas with high sun intensity or low light conditions. Automatically adjusts the video recordings to compensate for these extreme conditions. Image Resolution: The default setting is 4M. There are many image capture settings from 16M to 1.3M. Power: Car charger or battery. FULL HD VIDEO RECORDING; Utilizes the latest Ambarella A7LA50 Chipset imaging technology and OV4689 Lens for true high-def video capture.Recordings of full HD 1920*1080P videos and crystal-clear images at 30fps with a wide viewing angle. PARKING MONITOR;The AD282 car camera dvr features a parking monitor function which triggers auto-recording if a collision or shaking is sensed. 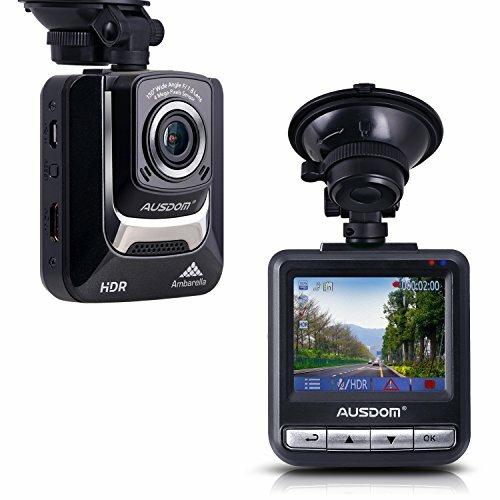 2.4 INCH TFT LCD DISPLAY; The car dash cam allows convenient and instant playback of recorded videos. AUTO RECORDING FUNCTION; This is an intelligent car camera DVR. It automatically comes on when you start your vehicle and will continue to record until you reach your destination. SMART SHAPE: The discreet design of a small square shape gives you a great view of everything in front of your vehicle.